This year’s Mozilla Festival will gather passionate, creative people using the web to bend, hack and reinvent media. We’ll solve real problems and build prototypes with talented designers, world-class journalists, and cutting-edge developers. We’ll meet in London, a true media capital, for three days fueled by innovation challenges. Drive new ways of making media with design jams, hackfests, learning labs, live demos and parties. At the Media, Freedom and the Web Festival, you’ll pull the best of modern web technology into the world of media. Collaborate with real-world journalists and daring technologists to build whatever inspired version of the media future you like. Minimum talking, maximum web making. In the 1980s the Internal Revenue Service underwent a controversial rebirthing. Turning away from its paper-laden, human-eye examiners, it looked to become a more automated, “noncompliance-seeking” (read: for-profit) outfit. The process, termed “the Initiative”, serves as the backdrop of Dave Foster Wallace’s self-described nonfictional memoir, The Pale King. It’s also a fitting case study of why we need data journalists and good data designers. According to DFW, the system-wide restructuring of the IRS was, obviously, massive. It affected every American and held great repercussions for business and the role of the state. But as Wallace reports, the Initiative was never investigated deeply by journalists. Why? Despite the Initiative’s far-reaching impact, the actual material recounting the IRS’ changes was never read. But not because an extensive public record wasn’t available (it was). Rather the written proceedings, in their mountains burocratese, were so utterly mind-numbingly boring that no one could bear plowing through them. The public record was solid rock. 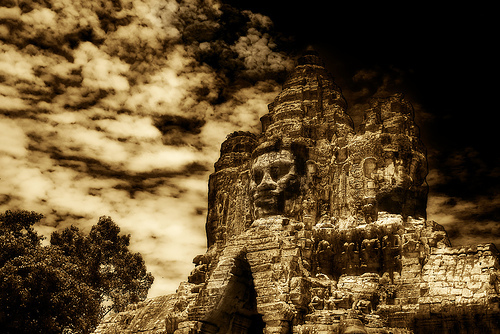 …one of the GS-11 Chalk Leaders in our Rote Exam group, a man of no small intuition and sensitivity, proposed an analogy between the public records surrounding the Initiative and the giant solid-gold Buddha statues that flanked certain temples in ancient Khmer. These priceless statues, never guarded or secured, were safe from theft not despite but because of their value—they were too huge and heavy to move. This is a brilliant insight. As DFW argues, we shouldn’t underestimate government’s reliance on this very strategy, the intentional opacity of the public record to discourage journalistic investigation. Secrecy invites curiosity and scandal — yet monumental dullness will pass unexamined. It’s striking how relevant this chapter is to the world of open data and journalism today. More and more data is being created and released. More and more journalists are expected to have data literacy. But without tools that support sensemaking and parse databases, the public record will remain unyielding and under-reported. Footnote HT to DFW. Mid-book, he slips in an author’s forward that counters the boilerplate disclaimer publishers are legally obliged to include: “all characters and events in this book are fictitious”. Instead, Wallace asserts that nearly all of the book’s content is true, documented from his year in exile at an IRS examination center in the Midwest. You get in a nice tangle trying to sort whether his statements about the book’s authenticity, which occur after the disclaimer, are in fact subject to the blanket disclaimer about everything in the book being fiction. And so on. “Believe nothing, O monks, merely because you have been told it,” says Buddha. 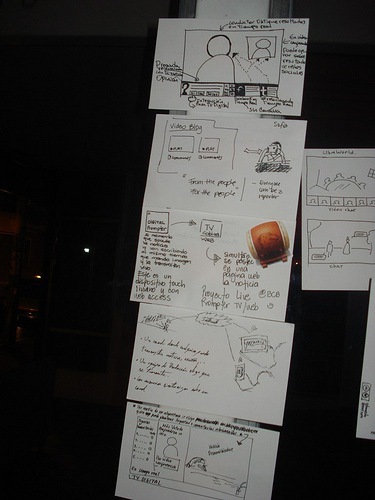 Drive events around design challenges / shared action. This boosts collaboration and gives purpose to the event. Specific, value-add challenges work better than very general ones (i.e. we got more action around the “Beyond Comments” challenge than from the broad “People=Powered News”. Articulate what makes the participant group unique. For MoJo, it was about bringing journalists, techies, and designers together to work on a specific problem set. This is also what we’re trying at the festivals, for example in Barcelona with the educators and web geeks. This gives another sense of purpose and focus. Frame the local event in a broader narrative arc that goes beyond the immediate timeframe. The Knight-Mozilla jams lead up to a longer term fellowship program and global conversation, and they’re a great feeder for the forthcoming festival, which focuses on Media, Freedom, and the Web. Provide assets to make it easier for organizers to plug and play. Evolve those assets when more ideas / improvements come in. We did this for the MoJo jams, for example adding the bingo icebreaker cards from Jennie in New York and slides in Spanish made by Renata in Guatemala. Run an evaluation afterward. That’s in progress now for MoJo, and the results will be shared soon. There’s much to learn and to discuss together around what types of events, themes, and processes work. Would love to hear from you all what you think about the above and from Mozilla events you’ve attended. Do you have ideas for how news and journalism can be edgier, cooler, and more interactive online? You can qualify directly for a yearlong, paid innovation fellowship at the BBC, Guardian, ZEIT Online, Boston Globe and Al Jazeera by rising to the Knight-Mozila News Innovation Challenges (#MoJo) during a news jam in your city. 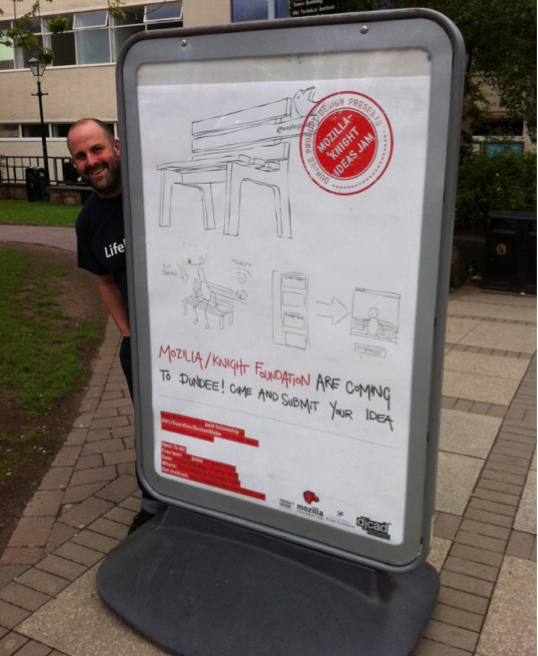 You can also submit your brilliant ideas online until close of business EST on June 5. In 15 cities around the world, hacks (journalists) and hackers (developers) are teaming up to build prototypes that help journalists take advantage of the open web and engage with citizens in new ways. You can join, too. 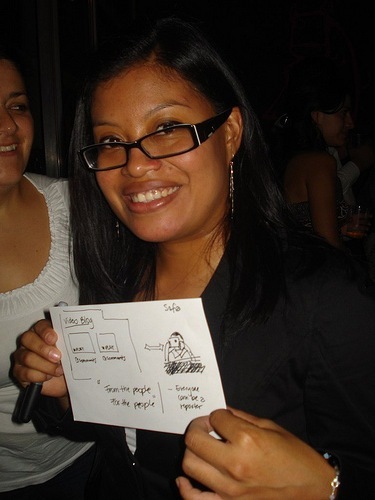 People-Powered News: What would you build to make news better for the people who create and read it? 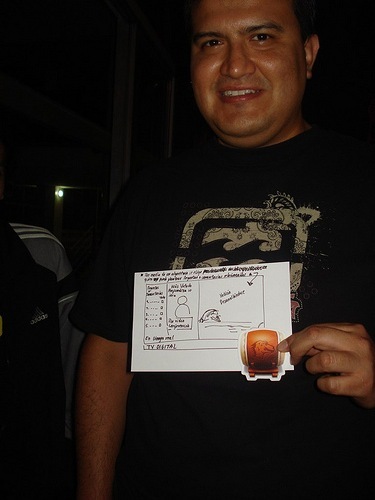 Innovators from San Francisco to Buenos Aires, from Guatemala City to Chicago, are sketching ideas on napkins, sharing experiences about journalism and the web, and being rewarded with beer (or MoJoitos) and good company. Particularly exciting is a partnership with Hacks/Hackers, a network of journalists and technologists, in several cities. Santiago, June 4 – spaces went like hot cakes. We’ve got lots of MoJo materials in Spanish, thanks to Renata. These innovation jams are also teeing up major projects and partnerships for the forthcoming Mozilla Festival, Media, Freedom and the Web, this fall in London. Stay tuned to learn how get involved, and visit Mozilla Journalism (@KnightMozilla) for more info on MoJo. Next time someone proclaims the world will end, you can get a rise out of them with a simple prank. Grab some old clothes and a pair of shoes (funny props are a good bonus). Scurry off to the nearest church or other religious establishment behind the alleged Judgement Day. Arrange clothing in a human-like pose. 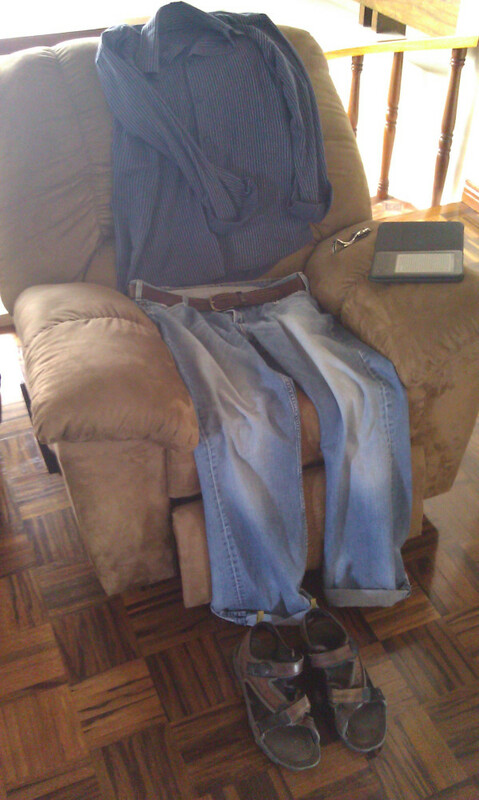 Voilà, a vaporized rapture victim. We broke our fast in San Salvador with tortillas, pancakes, and “American” coffee. A great tragedy in Central America is how delicious local foods, like coffee and tortillas stuffed with yumminess, are sold back to the region in the form of Starbuckes and Taco Bells. I know, I know. It’s globalization here as it is everywhere, but it’s still sad to see people waiting for hours in line for a latte from beans grown in their country but costing 3x as much. The Librebus hit the road for Guatemala City, just a few hours down the road. The temperature as we headed north became progressively cooler, a welcome relief from the heat of Nicaragua and Honduras. We reached Guatemala by mid-day, and after checking into the hotel, met up with about 10 Libre community folks: the CC Guatemala team, Free Software developers, a security contributor to Tactical Tech, and education and transparency advisers to various ministries. We landed in a number of national and local newspapers. 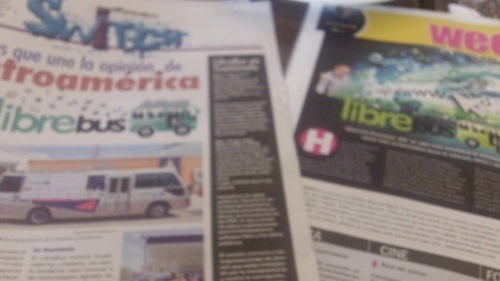 In general, media coverage of the Librebus was quite high. The journalists explained that in a region plagued with news about drug wars, violence, and corruption, a positive story about education, inter-regional collaboration, and idealism is fresh and welcome. 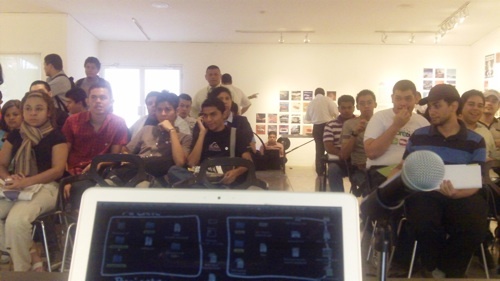 The CC Salon at the Centro Cultural de España in Guatemala City was our most well attended event yet. 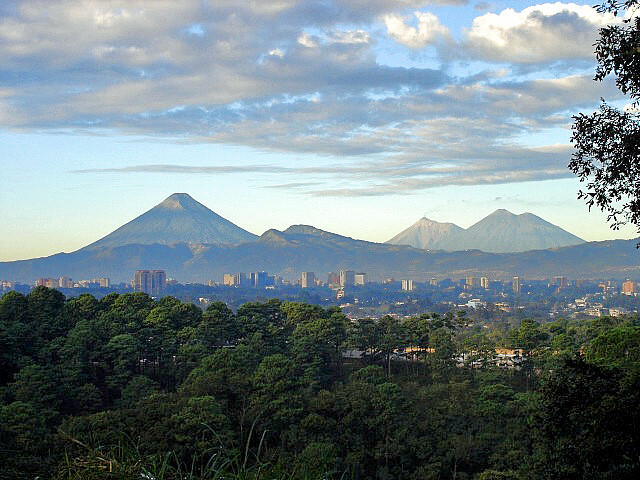 David, part of the budding CC team in Panama, commented that Guatemala has a level of activity and community that is a shining Free Culture star to the region. It’s true, and it’s not to be underestimated that it comes with the dedicated work of key people over several years (CC Guatemala signed its first MOU in 2006), growing the team and community one relationship at a time. One of the strengths in the country is the diversity of people who care about Free Culture and Free Software. And they’ve come to care about not through promotional talks, but through conversations about how these tools can help solve problems they encounter every day. Speaking at the salon was the Universidad Francisco Marroquin, the host institution of CC Guatemala. 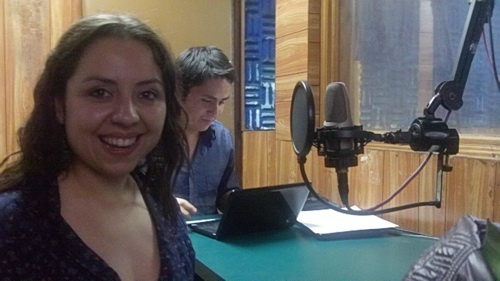 Their new media department is pioneering a video platform for courses. The service houses more than 17,000 1,700 videos from lectures and classroom activities, synced with a transcript and slides timed to the talk. You can select sections of the video and share links to exact that snippet. It’s pretty impressive. The platform uses various CC licenses for the lectures, and we spoke to them about releasing the platform’s code. I also demoed popcorn and hyperaudio, which got them excited about web standards and HTML5. 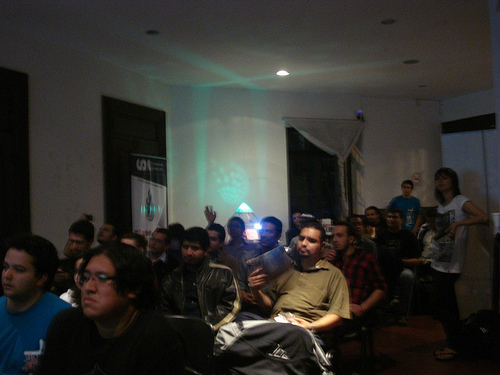 A film about DVD gray markets in Guatemala was screened by pirata tv, and the maestros de web, a freely licensed software & web documentation site, showed his platform. The latter reminded me of a huge advantage Latin America has when it comes to educational materials. Often, people I met outside the English-speaking world lament that it’s difficult, in their language, to reach a critical mass and have access to enough quality content in the subject of their choice. But Spanish is a language spoken by at least 500 million people. It’s an enormous advantage. There are lots of initiatives and repositories and study groups and hordes of content available in their language. And although understandably one can feel isolated if they’re the only ones in their country working in the field or producing content. But transcend geography (one of the internet’s perks, of course), and you’ve got collaborators and resources everywhere. This is a great insight for Central America, I think, not just language-and-critical-mass-of-content-wise, but in leveraging their mutual efforts more often and not reinventing the wheel in each admittedly small, not-so-densely populated country. 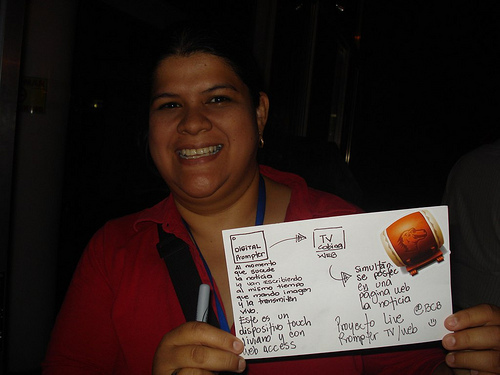 Having perfected the Knight-Mozilla MoJoito format in San Salvador, after the CC Salon we headed to a popular journo part in Guatemala City for round of brainstorming. It was a stellar attendance and a great vibe. 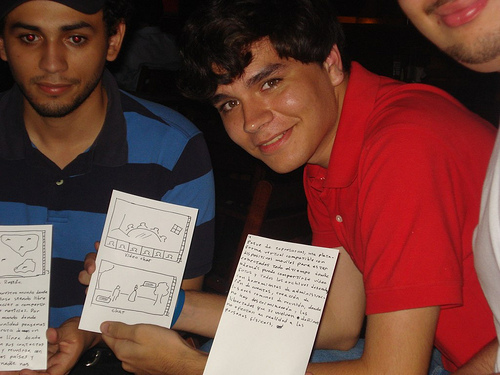 We set up a prominent table in the bar, taped up some example napkin sketches, and started handing out pens & paper. 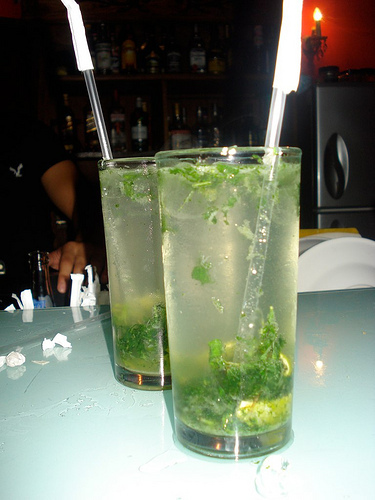 Over the course of the evening, 25 ideas rolled in and 25 MoJoitos rolled out. The ideas covered all sorts of ground and all sorts of approaches. Some highlights were: using SMS for citizens to text in news and send photos/video from a scene, interactive public screens showing the news and soliciting input from passers-by, live comment walls during news interviews that both the anchor and interviewee respond to and interact with, and a neat suggestion to double the news prompter, already employed to transcribe the action, as a video transcript generator and microblogger. The next morning a room of geeks and activists gathered at the cultural center for the country’s first public data hackathon. The goal of the event was to connect NGOs and technologists and to start driving demand for open data by piloting some use cases. I gave a brief overview of Linked Data and how the open data movement is shaping up in Europe and spots elsewhere. Where Does My Money Go and They Work For You for fiscal and political transparency really resonated with everyone, as Guatemala is entering an election year with a very corrupt government. Also, as David Foster Wallace has helped drive home in The Pale King, pattern recognition and storytelling must shine from these monumental data statues if the information is going to have any relevance. This takes time, and patience, and to some degree a tolerance for eye-glazing public documents, but the world is in a position to make these documents more eye-catching and comprehensible, not to mention immediate and compelling. So techies teaming up with journos, handling the human translation work together, is a powerful formula. And while the audience appreciated the examples from data.gov.whatevers from around the world, they also expressed the need to have visualization tools at their finger tips, so that whatever data crumbs are obtained can be instantly digestible. It’s of course the Holy Grail, but there are curations of key programs and tools already. Maybe we need a Tactical Tech-esque Data Journalism in a Box? 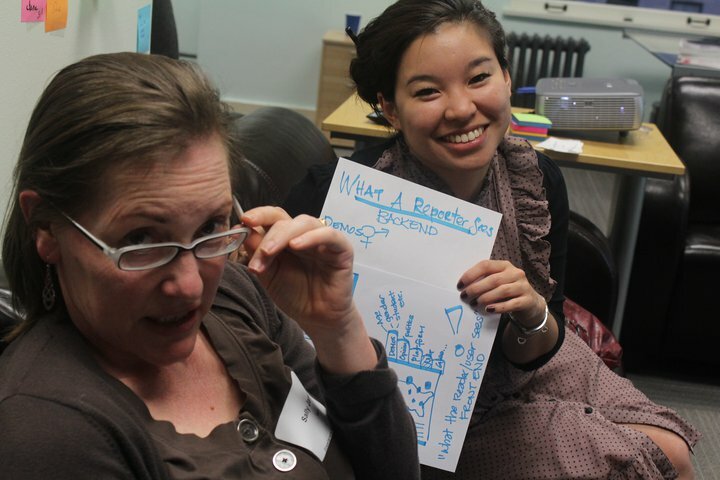 In any case, the crowd was primed for rolling up their sleeves and prototyping some action for public data. One group developed an infographic for the election process of Guatemala’s District Attorney, gleaned from an Excel spreadsheet on transparenciajudicial-gt.org. Another group created a podcast of recommendations for the transparency site, which you can catch the audio on SoundCloud. 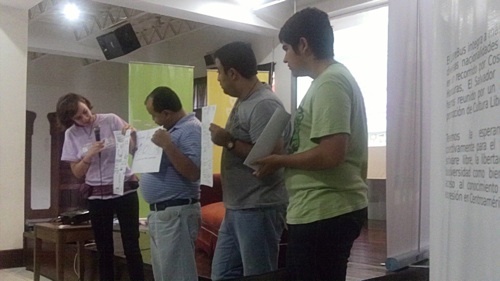 There were demos from Congreso Transparente.org and Open Wolf, and presentations from local NGOs and user groups. Hyper from a night of hotel-room karaoke with the Free Software program Performous, we jumped into the Librebus to journey from Tegucigalpa to San Salvador. We rolled into San Salvador to the generous hospitality of the city’s Centro Cultural de España for an evening of mingling and open pupusas. Pupusas are a delicious dish of corn tortilla with baked cheese inside topped with cabbage and salsa. You can apparently stuff them with all sorts of yummy things, like grilled veggies and guacamole. The Open Pupusas was a great reminder of how food is a perfect interactive medium. People bustling around with plates and managing messy meals really dissolves social inhibitions and a few bites in you find yourself bonding with a neighbor about how tasty everything is and by the way what do they do, what brought them here, etc etc. 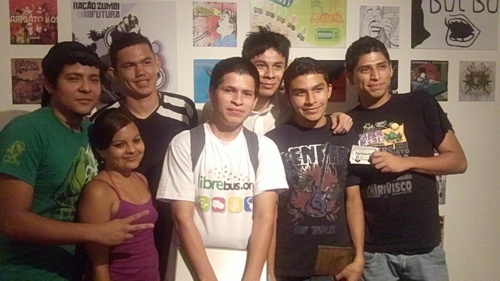 During the evening we met a cluster of Salvadorian digital natives, i.e. very wired kids that tweeted about heading to the event in cool Spanish net slang where “que” becomes “k” and everything is in a miXturRe of CapitAl leTTers. It was a lot of fun to hang out with them and think, wow, they must’ve been 8 or so when CC was founded. The movement is practically in a stage where a generation takes it for given and not recall a time when it wasn’t around. 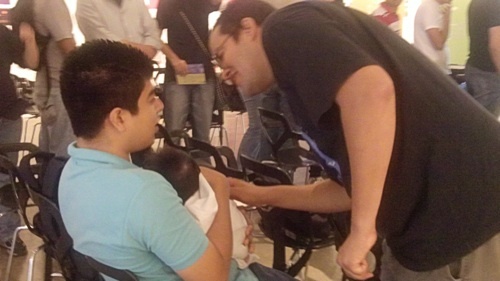 Speaking of the next generation, a Debian developer sat rocking an adorable newborn and explained that her name is Debbie Alejandra. Now that’s a real geek. The next morning we returned to the center and held some brief presentations about Free Software, freedom of expression, tech tools for transparency, and the Knight-Mozilla News Innovation Challenge. We broke into smaller groups to discuss the specific topics, and although I couldn’t follow the details in Spanish, the energy was high and the vibe great. 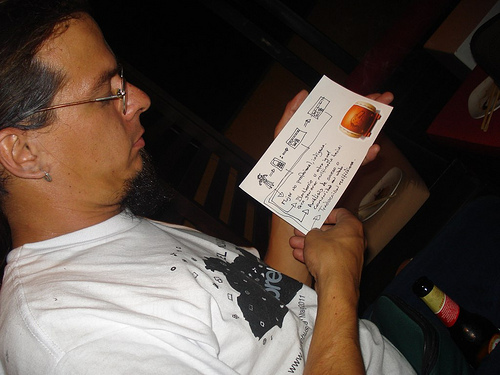 In general, the crowd seemed knowledgeable about the basic principles and projects of Free Software and Free Culture, which helped drive the conversation further. Clearing out of the cultural center, I headed with Renata to a local community radio station, where she went on the air to explain the Librebus. 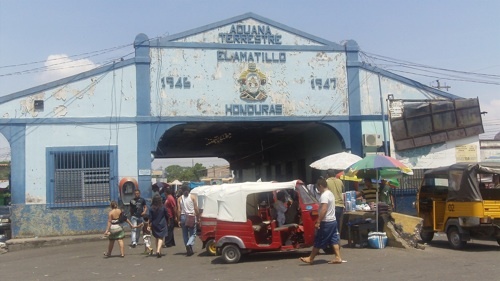 The national newspaper El Salvador dedicated an article to us as well. An evening of geeks and news innovation awaited at a nearby bar (regrettably located in a mall made possible by the obliteration of a precious forest, we later learned). We met to brainstorm around the Knight-Mozilla News Innovation Challenge (#MoJo), grabbing a pen and napkin and tackling the question: how can video online change news storytelling? Every successful submission scored the participant a mojoitos (our attempt at being punny), and the mood was fun and collaborative. Despite the intro talk (slides kindly translated into Spanish by Renata), it was difficult at first to explain what the scope of the idea should be, especially since the crowd was more of the geek, rather than journo, DNA. I suspect it helps to be more familiar with the domain in question (the news) when tossing out tangible problems to solve and suggestions to improve. In any case, they got warmed up after I whipped up a super simplified demo sketch. News photographers on assignment take hundreds if not thousands of pictures. But when their work is published, only a very select amount is used. Let’s conservatively say 1 in 100 photos. There’s a lot of waste in the system. What if there were a “megastore” for all the unused photos? What if all the digital scraps, the unpublished masses, were uploaded in a way that freed up storage space — fast and easily — from photographers’ cameras and offered them incentives, such as equipment discounts and promos, to get the pics online. A condition of submission could be waiving the rights and getting the photos in the public domain for maximum reuse. Crowdsourced tagging could be explored, for example, with image captchas to unlock phones or play games. Sponsors and high-scoring photographers would be featured prominently. And the public would have access to professional quality images and footage from all over the world. I think it’s a fantastic and very webby way of approaching news photography’s current inefficiencies. Renata will be writing it up more thoroughly soon. 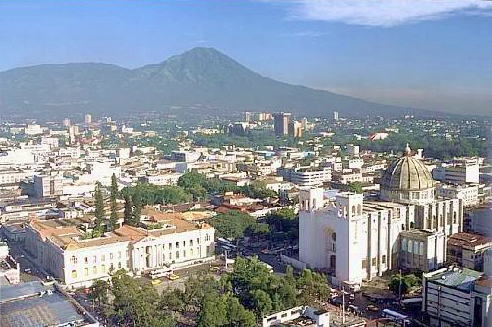 Can’t wait to see what comes out of the MoJo meetup tomorrow in Guatemala City!